Three quarters of executives in a global survey believe Artificial Intelligence (AI) will enable their companies to move into new businesses, while 84 per cent say AI will allow their companies to obtain or sustain a competitive advantage. The numbers come from Reshaping Business With Artificial Intelligence, published by MIT Sloan Management Review. They are based on a survey of more than 3000 executives, managers and analysts in 112 countries early this year. In the chart above (taken from the report), respondents were asked “Why is your organisation interested in AI?” The bars show the percentage of respondents who somewhat or strongly agree with each statement. One sizeable difference is their approach to data. AI algorithms are not natively “intelligent.” They learn inductively by analysing data. While most leaders are investing in AI talent and have built robust information infrastructures, other companies lack analytics expertise and easy access to their data. More than 80 per cent of respondents consider AI to be a strategic opportunity. In fact, more than half see no risks. Others, however, are less certain and cite concerns such as an increase in AI-driven competition. Executives simultaneously recognise that their organization will not likely be the sole beneficiary of AI in their markets. Respondents expect that both new entrants and incumbents would similarly see the potential for benefits. 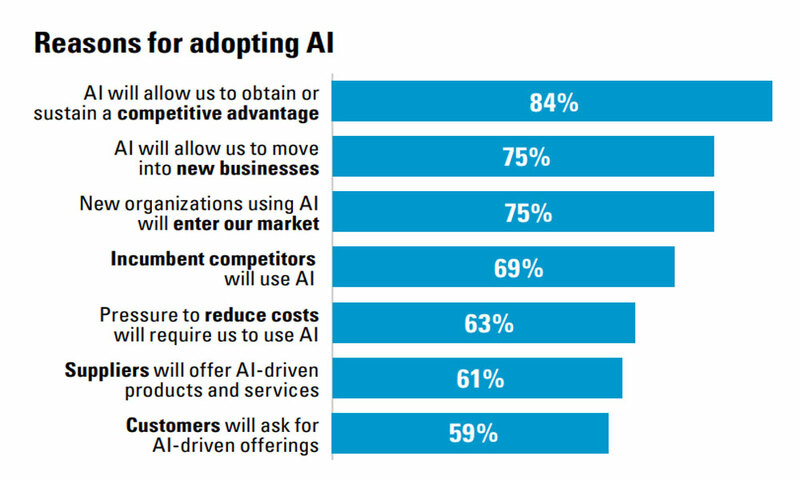 Three-quarters of respondents foresee new competitors using AI to enter their markets while 69% expect current competitors to adopt AI in their businesses. Whether businesses are motivated by a sense of opportunity, or by the fear of missing out, there’s no question that AI needs to be introduced and exploited sooner rather than later. So what are the barriers? technology, operations and manufacturing, supply chain management, and customer-facing activities. The culture change required to implement AI may be daunting – but the time to get started is now.